In this Japanese name, the family name is Asō. (video) Deputy Prime Minister Asō in front of the Gundam Cafe in Akihabara introducing prime minister Shinzō Abe (middle) with a speech, 2014. Tarō Asō (麻生 太郎, Asō Tarō, born 20 September 1940) is a Japanese politician who is the Deputy Prime Minister and Minister of Finance. Asō was the 59th Prime Minister of Japan, serving from September 2008 to September 2009. He was also a member of the Japanese shooting team at the 1976 Montreal Olympics. Asō has served in the House of Representatives since 1979. He was Minister for Foreign Affairs from 2005 to 2007, and was Secretary-General of the Liberal Democratic Party (LDP) briefly in 2007 and in 2008. He was President of the LDP from 2008 to 2009. His successor, Sadakazu Tanigaki, was chosen on 28 September 2009. After the LDP's victory in the 2012 general election under Shinzō Abe he was appointed to the cabinet as Deputy Prime Minister, Minister of Finance, and State Minister for Financial Services. He has held the positions since 26 December 2012. Asō, a Roman Catholic, was born in Iizuka in Fukuoka Prefecture on 20 September 1940. His father, Takakichi Asō, was the chairman of the Aso Cement Company and a close associate of Prime Minister Kakuei Tanaka; his mother Kazuko Asō was Prime Minister Shigeru Yoshida's daughter. Tarō is also a great-great-grandson of Ōkubo Toshimichi, and his wife, Chikako is the third daughter of Prime Minister Zenkō Suzuki. His younger sister, Nobuko, Princess Tomohito of Mikasa, is a cousin-in-law of Emperor Akihito. Asō graduated from the Faculty of Politics and Economics at Gakushuin University, and the London School of Economics. Asō spent two years working for a diamond mining operation in Sierra Leone before civil war forced him to return to Japan. Then he joined his father's company in 1966, and served as president of the Aso Mining Company from 1973 to 1979. Working for the company, he lived in Brazil during the 1960s and became fluent in Portuguese. He was also a member of the Japanese shooting team at the 1976 Summer Olympics in Montreal and President of the Japan Junior Chamber in 1978. He joined the Cabinet of Jun'ichirō Koizumi in 2003 as Minister of Internal Affairs and Communications. On 31 October 2005, he became Minister for Foreign Affairs. There has been some speculation that his position in the Cabinet was due to his membership in the Kōno Group, an LDP caucus led by pro-Chinese lawmaker Yōhei Kōno: by appointing Asō as Minister for Foreign Affairs, Koizumi may have been attempting to "rein in" Kōno's statements critical of Japanese foreign policy. Asō was one of the final candidates to replace Koizumi as prime minister in 2006, but lost the internal party election to Shinzō Abe by a wide margin. Both Abe and Asō are conservative on foreign policy issues and have taken confrontational stances towards some East Asian nations, particularly North Korea and, to a lesser extent, the People's Republic of China. Abe was considered a more "moderate" politician than the more "hard-line" Asō, and led Asō in opinion polling within Japan. Asō's views on multilateralism are suggested in a 2006 speech, "Arc of Freedom and Prosperity: Japan's Expanding Diplomatic Horizons". Asō acknowledged that he would most likely lose to Fukuda, but said that he wanted to run so that there would be an open election, saying that otherwise LDP would face criticism for making its choice "through back-room deals". In the President election, held on 23 September, Fukuda defeated Asō, receiving 330 votes against 197 votes for Asō. On 1 August 2008, Fukuda appointed Asō as Secretary-General of LDP, a move that solidified Asō's position as the number two man in the party. Unexpectedly on 1 September 2008, Fukuda announced his resignation as Prime Minister. Five LDP members including Asō ran for new party President to succeed Fukuda. On 21 September, one day before votes of Diet party members, Asō reportedly told a crowd of supporters outside Tokyo: "The greatest concern right now is the economy." "America is facing a financial crisis ... we must not allow that to bring us down as well." Finally on 22 September, Asō did win. He was elected as President of LDP with 351 of 525 votes (217 from 384 Diet party members, 134 from 47 prefecture branches); Kaoru Yosano, Yuriko Koike, Nobuteru Ishihara, Shigeru Ishiba got 66, 46, 37, 25 votes respectively. Two days later on 24 September, Asō was designated by the Diet as Prime Minister, and was formally appointed to the office by the Emperor on that night. In the House of Representatives (lower house), he garnered 337 out of 478 votes cast; in the House of Councillors (upper house), Ichirō Ozawa, President of the main opposition Democratic Party of Japan, was named through two times of ballots. Because no agreement was reached at a joint committee of both Houses, the resolution of the House of Representatives became the resolution of the Diet, as is stipulated in the Constitution. Asō reportedly said, "If you look at the current period, it's not a stable one." and "These are turbulent times with the financial situation and everything else." Later on the same day as his election as Prime Minister, Asō personally announced his new Cabinet (this is normally done by the Chief Cabinet Secretary). His Cabinet was markedly different from the preceding Cabinet under Fukuda. Five of its members had never previously served in the Cabinet, and one of them, 34-year-old Yūko Obuchi, was the youngest member of the Cabinet in the post-war era. 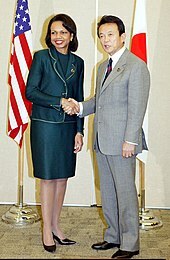 Prime Minister Asō flew to Washington to meet with United States President Barack Obama in February 2009. He was the first foreign leader to visit the Obama White House; however, reports suggested that the new administration was interested less in giving Asō a political boost than in sending a message that Japan continues to be an important ally and partner – a low-risk, high-payoff gesture for both Asō and Obama. After his election as prime minister Asō was expected to dissolve the lower house to clear the way for a general election. But he repeatedly stressed the need for a functioning government to face the economic crisis and ruled out an early election. Only after passage of the extra budget for fiscal 2009 in May and facing internal pressure from the LDP after a series of defeats in regional elections – most notably the Tokyo prefectural election on 12 July – he decided to announce a general election for 30 August 2009. He dissolved the House of Representatives on 21 July 2009. The LDP lost by a landslide to Democratic Party of Japan, in the face of record levels of post-war unemployment. Accepting responsibility for the worst (and second-only) defeat of a sitting government in modern Japanese history, Asō immediately resigned as LDP president. Tarō Asō meeting President of Russia Dmitry Medvedev in Yuzhno-Sakhalinsk on 18 February 2009. When Shinzo Abe returned to the Prime Minister's office in 2012, Aso is appointed Deputy Prime Minister and Minister of Finance. He is the first former Japanese Prime Minister to subsequently serve as Deputy Prime Minister. In 2001, as economics minister, he was quoted as saying he wanted to make Japan a country where "rich Jews" would like to live. On 15 October 2005, during the opening ceremony of the Kyushu National Museum which also displays how other Asian cultures have influenced Japanese cultural heritage, he praised Japan for having "one culture, one civilization, one language, and one ethnic group", and stated that it was the only such country in the world. At a lecture in Nagasaki Prefecture, Asō referred to a Japanese peace initiative on the Middle East, stating, "The Japanese were trusted because they had never been involved in exploitation there, or been involved in fights or fired machine guns. Japan is doing what the Americans can't do. It would probably be no good to have blue eyes and blond hair. Luckily, we Japanese have yellow faces." Tarō Asō meeting President Barack Obama in the White House. Kyodo News reported that he had said on 4 February 2006, "our predecessors did a good thing" regarding compulsory education implemented during Japan's colonization of Taiwan. On 21 December 2005, he said China was "a neighbour with one billion people equipped with nuclear bombs and has expanded its military outlays by double digits for 17 years in a row, and it is unclear as to what this is being used for. It is beginning to be a considerable threat". On 28 January 2006, he called for the emperor to visit the controversial Yasukuni shrine. He later backtracked on the comment, but stated that he hoped such a visit would be possible in the future. Mainichi Daily News reported that on 9 March 2006 he referred to Taiwan as a "law-abiding country", which drew strong protest from Beijing, which considers the island a part of China. On 23 September 2008, Akahata, the daily newspaper published by Japanese Communist Party released a compiled list of these and other statements as the front-page article criticizing Asō. This compilation as well as similar lists of blunders have been frequently cited in the Japanese media. Yahoo! News reported that he had said on 9 January 2009, "To work is good. It's completely different thinking from the Old Testament." While speaking at a meeting of the National Council on Social Security Reform, in 2013, Asō referred to patients suffering from serious illness as "tube persons" and remarked that they should be "allowed to die quickly" if they desired it. "Heaven forbid I should be kept alive if I want to die", he is quoted as saying. "You cannot sleep well when you think it's all paid by the government. This won't be solved unless you let them hurry up and die." In 2014, while campaigning in Sapporo for the general election, Asō said that rising social welfare costs were not solely due to an aging population. He said, "There are many people who are creating the image that (the increasing number of) elderly people is bad, but more problematic is people who don't give birth",. The comment was labeled as insensitive to those who are not able to have children for biological or economic reasons. The Guardian reported on 30 August 2017, that he said, "Hitler, who killed millions of people, was no good even if his motive was right." He later retracted the remarks. Aso caused a stir in June 2018 when he boasted that the large support towards the LDP among voters under 35 in the 2017 general election was due to the demographics being illiterate about the news and current affairs. Affiliated to the openly revisionist organization Nippon Kaigi, Asō believes that Japan committed no war crimes during the Pacific War. Australian POWs forced to work at the Aso mining company, photographed in August 1945. In mid-2008 Asō conceded that his family's coal mine, Aso Mining Company, was alleged to have forced Allied prisoners of war to work in the mines in 1945 without pay. Western media reported that 300 prisoners, including 197 Australians, 101 British, and two Dutch, worked in the mine. Two of the Australians, John Watson and Leslie Edgar George Wilkie, died while working in the Aso mine. In addition, 10,000 Korean conscripts worked in the mine between 1939 and 1945 under severe, brutal conditions in which many of them died or were injured while receiving little pay. The company, now known as the Aso Group, is run by Asō's younger brother. Asō's wife serves on its board of directors. Asō headed the company in the 1970s before going into politics. Acting on a request from Yukihisa Fujita, the Foreign Ministry investigated and announced on 18 December 2008 that Aso Mining had, in fact, used 300 Allied POWs at its mine during World War II. The ministry confirmed that two Australians had died while working at the mine, but declined to release their names or causes of deaths for "privacy reasons". Said Fujita, "Prisoner policy is important in many ways for diplomacy, and it is a major problem that the issue has been neglected for so long." Asō has not responded to requests from former laborers to apologize for the way they were treated by his family's company. The Japanese media noted in November 2008 that Asō often mispronounced or incorrectly read kanji words written in his speeches, even though many of the words are commonly used in Japanese. Asō spoke of the speaking errors to reporters on 12 November 2008 saying, "Those were just reading errors, just mistakes." Asō's tendency for malapropisms has led comparisons to George W. Bush, and the use of his name, "Tarō" as a schoolyard taunt for unintelligent children. An anatomy professor from the University of Tokyo, Takeshi Yoro, speculated that Asō could possibly suffer from dyslexia. In 2001, Asō, along with Hiromu Nonaka, was among the LDP's chief candidates to succeed Yoshirō Mori as prime minister of Japan. During a meeting of LDP leaders at which Nonaka was not present, Asō reportedly told the assembled group, "We are not going to let someone from the buraku become the prime minister, are we?" Asō's remark was apparently a reference to Nonaka's burakumin, a social minority group in Japan, heritage. Nonaka subsequently withdrew as a candidate. Asō eventually lost the appointment to Jun'ichirō Koizumi. Asō's comment about Nonaka's heritage was revealed in 2005. Asō denied that he had made the statement, but Hisaoki Kamei, who was present at the 2001 meeting, stated in January 2009 that he had heard Asō say something, "to that effect". Nonaka said that he would "never forgive" Asō for the comment and went on to state that Asō was a "misery" to Japan. In October 2008, the Japanese media reported that Asō dined-out or drank in restaurants and bars in luxury hotels almost nightly. When asked about it, Asō stated, "I won't change my style. Luckily I have my money and can afford it." Asō added that if he went anywhere else, he would have to be accompanied by security guards which would cause trouble. According to the Asahi Shimbun, Asō dined-out or drank at bars 32 times in September 2008, mainly at exclusive hotels. Asō's predecessor, Yasuo Fukuda, dined-out only seven times in his first month in office. Both of the LDP's opposition parties have called Asō's frequent outings inappropriate. Asō's Chief Cabinet Secretary, Jun Matsumoto, commented on the issue by saying that Asō's frequent trips to restaurants, "is his lifestyle and philosophy, and I am not in a position to express my opinion. If only there were more appropriate places when considering security issues and not causing trouble for other customers." Asō argues that embracing Japanese pop culture can be an important step to cultivating ties with other countries, hoping that manga will act as a bridge to the world. He is referred to as an otaku. Asō has been a fan of manga since childhood. He had his family send manga magazines from Japan while he was studying at Stanford University. In 2003, he described reading about 10 or 20 manga magazines every week (making up only part of Asō's voracious reading) and talked about his impression of various manga extemporaneously. In 2007, as Minister for Foreign Affairs, he established the International Manga Award for non-Japanese manga artists. It was reported that he was seen reading the manga Rozen Maiden in Tokyo International Airport, which earned him the sobriquet "His Excellency Rozen". He admitted in an interview that he had read the manga; however, he said he did not remember whether he had read it in an airport. He is a fan of Golgo 13, a long-running manga about an assassin for hire. Asō's candidacy for the position of Japanese Prime Minister actually caused share-value to rise among some manga publishers and companies related to the manga industry. As a Roman Catholic, Asō belongs to the small minority of Japanese Christians, but he has not emphasized his religiosity. Asō is the seventh Christian prime minister of Japan, after Takashi Hara, Korekiyo Takahashi, Tetsu Katayama, Ichirō Hatoyama, Masayoshi Ōhira, and his own grandfather Shigeru Yoshida. His Christian name is Francisco (フランシスコ). On occasion of his 2009 new year visit to the Shinto Ise Shrine, Asō publicly performed the hand-clapping in front of the shrine, stating later that he had "prayed for the good of the Japanese people". Asō is a patrilineal descendant of the Asō clan and is maternally descended from Ōkubo Toshimichi through his son Count Makino Nobuaki. Through his paternal grandmother the Hon. Kanō Natsuko, he descends from the Tachibana clan of the Miike Domain and from a cadet branch of the Ōkubo clan, who ruled the Odawara Domain. Aso, Taro (2007). 自由と繁栄の弧. Tokyo: Gentosha. ISBN 978-4-344-41197-5. Aso, Taro (2007). とてつもない日本. Tokyo: Shinchosha. ISBN 978-4-10-610217-2. ^ Ashcraft, Brian (10 October 2010). "Former Prime Minister Wants Japanese Youth To Drink Cute Booze". Kotaku. Retrieved 19 January 2018. ^ "Hardline Hawk or Unapologetic Bigot?" Archived 17 January 2006 at the Wayback Machine, Coming Anarchy, 1 November 2005. ^ Calder, Kent E. and Francis Fukuyama. (2008). East Asian Multilateralism: Prospects for Regional Stability, pp. 179–180. ^ "Fukuda wins LDP race / Will follow in footsteps of father as prime minister", The Daily Yomiuri, 23 September 2007. ^ "Fukuda overhauls Cabinet / LDP executive shakeup also elevates Aso to party No. 2", The Yomiuri Shimbun, 2 August 2008. ^ "Fukuda announces resignation as prime minister of Japan"[dead link], The Mainichi Daily News, The Mainichi, 1 September 2008. ^ "Conservative Aso chosen as Japan PM" Archived 25 September 2008 at the Wayback Machine, AFP, 22 September 2008. ^ "About us", The Democratic Party of Japan. ^ a b 5TH LD: Aso elected Japan's prime minister, to form Cabinet, Kyodo News International (September 24, 2008). ^ "The Constitution of Japan" Archived 14 December 2013 at the Wayback Machine. Translation (presumably of non-official) available on the Cabinet PR site. ^ "Japan ruling party leader elected prime minister"[dead link], from The Associated Press on The Washington Post, 24 September 2008. ^ Harden, Blaine. "Japan's Beleaguered Leader to See Obama," The Washington Post. 24 February 2009. ^ "Taro Aso confirmed as Japan's PM". BBC News. 24 September 2008. Retrieved 23 July 2009. ^ "Aso again says no election soon. Dealing with economic crisis takes priority". The Japan Times. 16 March 2009. Retrieved 23 July 2009. ^ "Japan's PM Aso calls August vote". BBC News. 13 July 2009. Retrieved 23 July 2009. ^ "Lower house dissolved for general election. Aso says seeks 'a mandate from the public'". The Japan Times. 21 July 2009. Archived from the original on 24 July 2009. Retrieved 23 July 2009. ^ a b McCurry, Justin (23 March 2007). "Blue eyes, blond hair: that's US problem, says Japanese minister". The Guardian. London. Retrieved 19 September 2007. ^ Christopher Reed, "Ghosts of Wartime Japan Haunt Koizumi's Cabinet", New America Media, 3 November 2005. ^ Kyodo, "Taiwan colonization was 'good': Aso", The Japan Times Online, 5 February 2006. ^ "Japan alarmed by Chinese 'threat'", BBC, 22 December 2005. ^ Kyodo,"Aso rapped for emperor shrine visit remark", CHINAdaily.com.cn, 29 January 2006. ^ "新総裁 麻生氏 発言録", しんぶん赤旗, Japanese Communist Party, 13 September 2008. ^ Yahoo, "World religions can learn from Japan: PM", Yahoo!News, 9 January 2009. ^ "Japanese deputy PM sorry for harsh remarks about seniors." Ottawa Citizen. (January 23, 2013 Wednesday ): 174 words. Web. Date Accessed: 2017/10/30. ^ "Gaffe-prone Taro Aso puts his foot in it again." China Daily. (December 9, 2014 Tuesday ): 260 words. Web. Date Accessed: 2017/10/30. ^ "Japanese minister Taro Aso praises Hitler, saying he had 'right motives'"
^ "Taro Aso repeats comment on alleged sexual harassment that sparked nationwide protest one day earlier". The Japan Times Online. 8 May 2018. ISSN 0447-5763. Retrieved 21 July 2018. ^ "Japanese Official Says Font Size on Sexual Harassment Complaint Was Too Small". Bloomberg.com. Retrieved 21 July 2018. ^ Underwood, William, "Aso Mining's POW labor: the evidence", Japan Times, 29 May 2007. ^ Underwood, William, "WWII forced labor issue dogs Aso, Japanese firms", Japan Times, 28 October 2008, p. 16. ^ Ito, Masami, "It's official: Aso family mine used POW labor", Japan Times, 19 December 2008, p. 1. ^ "Ito, Masami, "Pair seek POW apology from Aso", Japan Times, 20 June 2009, p. 2. ^ Reuters "Japan PM Faces Reading Test As Popularity Sags Archived 1 February 2009 at the Wayback Machine", "Javno", 20 January 2009. ^ Hongo, Jun, "Aso raises eyebrows with nonwords and wrong words", Japan Times, 14 November 2008. ^ "Bumbling Taro Aso becomes Japans answer to George Bush". The Times. London. 5 February 2009. Retrieved 24 May 2010. ^ a b Yamaguchi, Mari, "Discrimination claims die hard in Japan", Japan Times, 25 January 2009, p. 2. ^ Kyodo News, "Aso gets riled when quizzed over swanky wining, dining", reported in the Japan Times, 23 October 2008, p. 2. ^ Ito, Masami, "Aso defends his high-flying social life," Japan Times, 24 October 2008, p. 2. ^ a b "Manga shares gain on leader hopes". BBC News. 12 September 2007. Retrieved 22 December 2007. ^ "「御宅族」行「漫畫外交」受年輕人追捧 ("Otaku"'s "Manga diplomacy" celebrated by youngsters)". Wenweipo. 23 September 2008. ^ a b "麻生太郎　コミックを語る (Taro Aso talks about comics)". Big Comic Original (in Japanese). Shogakukan (original publisher), Aso Taro Office (copy). 2 July 2003. Archived from the original on 11 December 2007. Retrieved 22 December 2007. ^ "International Manga Award". The Ministry of Foreign Affairs of Japan. Archived from the original on 19 December 2007. Retrieved 22 July 2007. "Speech by Minister for Foreign Affairs Taro Aso at Digital Hollywood University". Retrieved 12 September 2007. "Japan Launches International Manga Award". Retrieved 12 September 2007. ^ Nakajima, Makoto. (2008). The Akiba: A Manga Guide to Akihabara, p. 25. ^ "麻生太郎「直撃! ローゼンメイデン疑惑?」 (Rozen Maiden suspicion: Interview with Aso Taro)". Mechabi Vol. 1 (in Japanese). Kodansha. 2 June 2006. ISBN 978-4-06-179591-4. ; Taro Aso (June 2007). 自由と繁栄の弧 (in Japanese). Gentosha. pp. 296–305. ISBN 978-4-344-01333-9. ^ (in Italian) Carrcer, Stefano. "Taro Aso, un cattolico in corsa per la guida del Giappone," Il Sole 24 Ore (Milano). 19 September 2008. Wikimedia Commons has media related to Tarō Asō.